St. Edmund’s School provides opportunities for personal excellence in educational academic and extra-curricular activities. Programs include: Leadership, Athletics, Fine Arts, Technology, Enrichment and Student Support. With our philosophy of educating the whole child, the spiritual development of the children is integrated into all areas of the curriculum. We look forward to sharing this with our community during our Student Led Conferences & Open House on February 22nd! Registration packages for the school year 2019/2020 will be distributed to all returning in-school families at the Annual General Meeting on Wednesday, February 20th at 7:00 pm. To the families of St. Edmund’s, we look forward to seeing you all at the upcoming AGM. The meeting will take place first and registration packages will be handed out following the meeting so please ensure that at least one family member attends. It is required that at least one family member attends. On behalf of my fellow PEC members we hope to see you all there! Just another reminder: Pedestrians, please use the designated crosswalk to cross 6th Street into the backyard of the school. We would also like to remind all drivers to respect the posted “no stopping signs” near our 6th Street entrance gate and encourage drivers to drop-off on Mahon Avenue. Children can enter using the gate between the school and Church. We have been working with the City of North Vancouver & Urban Systems to discuss road & personal safety improvements so that we can increase the number of children walking, rolling and cycling to school. Thanks to all of you who responded to our safety survey. Much gratitude goes out to our crossing guards who are at our intersections helping out with pedestrian safety! This annual event was started as a means of recognizing the importance of Catholic Education. 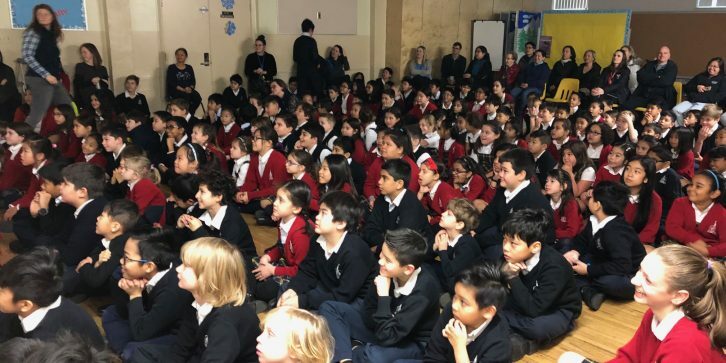 Our CISVA schools offer our children many opportunities to explore their talents – spiritually and academically, as well as in the fine arts and athletics. To begin our focus on our appreciation of Catholic Education we will be partnering with our feeder school STA to have student representatives attend masses on February 9th & 10th to thank our parish for their continued support of our schools. We ask that all students who attend Catholic schools (including high schools) come to Mass dressed in their uniforms as a sign to our parishioners that we are proud of our schools. Let’s have great participation in this event and show everyone how proud we are of our wonderful school, St. Edmund’s! The Catholic Educators’ Conference (CEC) is held each year to provide opportunity for the spiritual and professional growth of Catholic educators, for the development of Christian community, and to provide leadership in the development of a dynamic, evangelistic school system. In addition to celebrating mass together, this year’s highlights include: an opportunity to listen to our opening General Session speaker Hallie Lord – as a wife and mother of eight she is also host of Hallie Weekly on Sirius XM, co-founder of the Edel Gathering, and author of On the Other Side of Fear. Educators will also have the opportunity to attend breakout sessions led by Deborah Macnamara, Kevin Honeycutt, and Tiffany Poirier to hear about further strategies to support our students. Day 2 of the conference will continue with our John O’Leary leading the General Session, followed by several speakers who will be featured in ‘Edtalk’ style presentations. Our day will end as we gather once again to listen to our Closing General Session speaker. Both days will include celebration of the Eucharist with educators from the Vancouver, Kamloops and Nelson Archdioceses. The gym has been packed and the sounds of basketballs ring through the air! Our fabulous T-birds are working hard to develop and refine their basketball skills while sharing a love of the game with our other CISVA schools. Win or lose, we are proud to play our best and show respect teammates, other players, coaches, scorekeepers, and officials. Many thanks to our parent drivers who transport our players, making these opportunities possible. Please refer to our school website calendar for upcoming games and stop by the gym to cheer for our teams! Prior to reports cards being sent home on March 14th, your child will have the opportunity to communicate their learning to you at the Student Led-Conferences on Friday, February 22nd from 9:00am – 3:00 pm. Stay tuned for an email that will inform, you of details for setting up your appointment times.